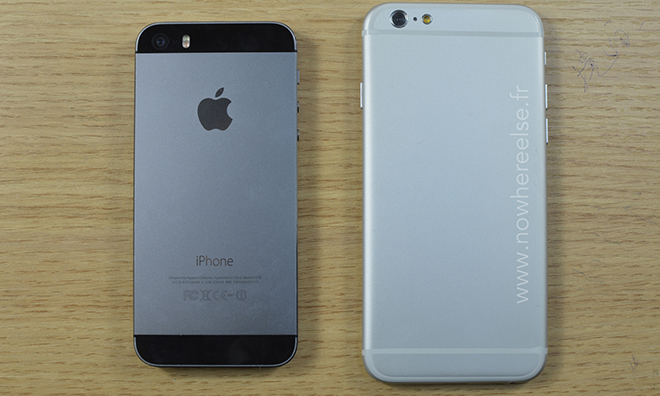 Due to supply constraints, Apple's rumored 4.7-inch "iPhone 6" handset is not expected to come with optical image stabilization (OIS) components, one analyst says, though yields may be high enough to include the part in a larger 5.5-inch variant. In a research note obtained by AppleInsider, noted KGI analyst Ming-Chi Kuo predicts the smaller 4.7-inch version of Apple's expected iPhone 6 will use a middle-mount open-loop voice coil motor, not an OIS VCM. The part is said to be an updated version of what is being used in the iPhone 5s. Two new sizes: 4.7" & 5.5"
Unlike common VCMs, an OIS system mechanically controls a light path as it travels from lens to sensor either through manipulation of lens elements or the sensor itself. OIS modules are more expensive than middle-mount VCMs and, in some cases, can be heavier as well. Kuo sees Apple deploying an OIS VCM in the 5.5-inch iPhone 6 to further differentiate the "phablet" from the company's other handset offerings. With superior image quality, the larger iPhone can be marketed as a higher-end device with a substantially different feature set. The analyst estimates the OIS part comes at a $3 or $3.5 premium over the iPhone 5s VCM. Despite the lack of OIS in the 4.7-inch handset, the middle-mount VCM is said to outperform the current iPhone 5s in terms of focus speed and power efficiency. Put up against competing smartphones, however, the open-loop VCM Apple plans to deploy is deficient. Handsets like Samsung's Galaxy S5 and the upcoming Mi4 from Xiaomi feature closed-loop VCM designs that track focus points for quick focusing and power-efficient operation. While focus and stabilization hardware may differ between the two models, Kuo is confident that both iPhone 6 versions will use an 8-megapixel Sony sensor customized especially for Apple. Combined with Apple's vertical software and hardware integration, the complete package will likely be a market leader when the device sees launch later this year, Kuo said. Apple has traditionally shied away from battling rival manufacturers on specs like megapixels, instead focusing on finer details to eke out the highest performance possible from existing platforms. For example, the camera sensor used in the iPhone 5s boosted pixel size to 1.5 microns in diameter, increasing the module's light gathering capabilities by 33 percent compared to the iPhone 5. The change was accompanied by a faster f/2.2 lens group that offered improved low-light performance and higher image quality.